Midlands Pumps offers complete solutions to farmers throughout Africa – from design of the system to completion and commissioning – removing the complexity around attaining fully-operational water systems. Considering the capital outlay in equipment for installations, it is essential to ensure the borehole can sustainably supply what is required in the long term. Before equipping any borehole, Midlands Pumps ensures the return on investment for farmers by conducting Sustainability Yield Testing. As a specialist service, Midlands Pumps upgrades control panels to Variable Frequency Drives or Soft Start systems for small and large applications to eliminate the in-rush current and ensure systems are running optimally. Midlands Pumps offers specialised solar and wind turbine borehole and surface pumping options for use where electrical power is not available – from livestock water to pumping large volumes to irrigation dams. Supply, repair, and replacement of irrigation pumps, motors, and control panels. Specialised large-scale irrigation borehole installations. Smaller domestic borehole installations for farmstead water supply. 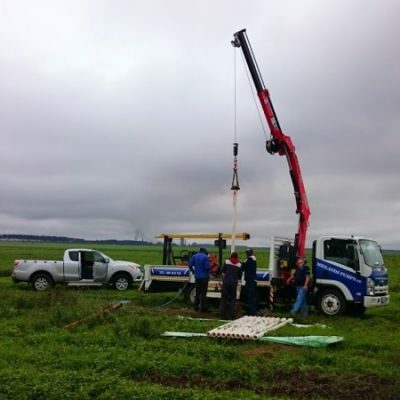 Borehole siting and drilling services – offered exclusively by Ground Water Association of KwaZulu-Natal affiliates. Midlands Pumps are the sole importers of Boresaver in Southern Africa – an environmentally friendly and effective chemical to alleviate iron oxide (ferrous oxide) problems – especially in production boreholes and for clients in coastal regions. As with every business, farming requires strategic planning and thinking in order to acquire a competitive edge and streamline operations. When it comes to water, this means tapping into a water source which is reliable enough to provide for daily requirements and to avert crisis when access to water is limited. In sourcing and implementing agricultural water strategies, any farmer would welcome an unrestricted supply of water on their own land. Every farming operation is unique, yet every farm – from small plots to large-scale agricultural operations – stands to benefit from a continuous, independent water source to meet their individual requirements. Founded on providing long-term sustainable solutions to farmers, Midlands Pumps are well-established as industry leaders in borehole and pump installations. Partnering with farmers for more than 25 years, they are uniquely placed to provide customised service and holistic solutions through in-depth knowledge and their extensive agricultural experience. Donec quam felis, ultricies nec, pellentesque eu, pretium quis, sem. Nulla consequat massa quis enim.